MOSCOW, December 30. /TASS/. 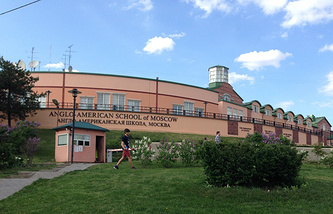 Information on the closure of the Anglo-American School in Moscow spread by CNN is completely false, Russian Foreign Ministry Spokeswoman, Maria Zakharova, wrote on her Facebook. "US officials ‘anonymously informed’ their media that Russia closed the Anglo-American School in Moscow as a retaliatory measure," she said. "That’s a lie. Apparently, the White House has completely lost its senses and began inventing sanctions against its own children." "You should not write that ‘Moscow denied…. Or Moscow will not…". Write as it is: "The CNN TV channel and other Western media have again spread false information citing official American sources," Zakharova stated. CNN earlier reported that Russian authorities ordered the closing of the Anglo-American School in Moscow as a retaliatory measure after Washington imposed new sanctions on Russia. On December 29, it became known that Washington slapped new sanctions on Moscow over its supposed cyberattacks on US institutions. The restrictive measures announced on Thursday apply to some Russian companies, the Federal Security Service and the Russian General Staff’s Main Department and its senior officials. In addition to that, US authorities declared 35 Russian diplomats persona non grata. Washington also informed Moscow that it would deny Russian personnel access to two recreational compounds in the United States owned by the Russian government. Moscow has repeatedly denied any involvement in cyberattacks. Commenting on the new sanctions, Russian Presidential Spokesman Dmitry Peskov said they are a manifestation of aggression.